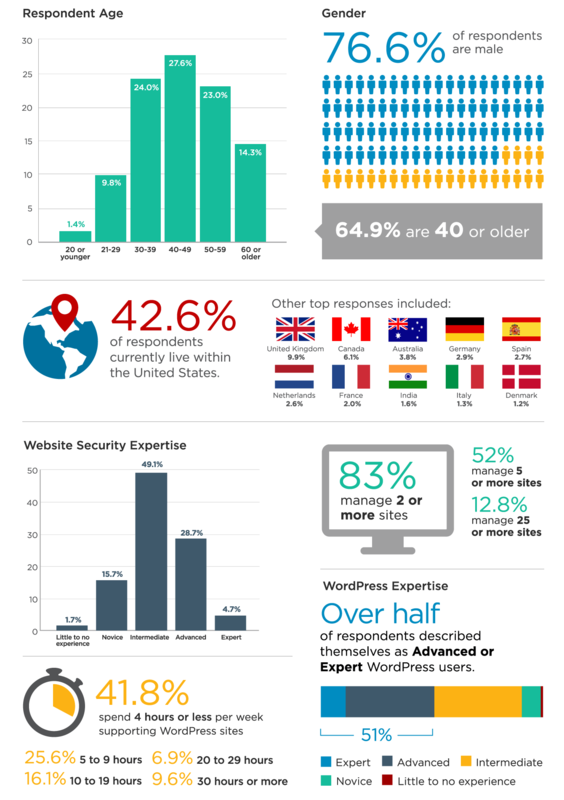 We are pleased to present to you the results of our first annual WordPress Security Survey. 7,375 of you responded, thank you! We have compiled the detailed results for you below. As a group, you are using WordPress for a wide variety of important things including business. Your WordPress security habits are decent but leave a lot to be desired. Hacks are unfortunately much too common, with almost forty percent of you reporting one hack in the last year. We hope that you find the results compelling and that you leverage the rest of our WordPress Security Learning Center as you work to improve the security of your website. 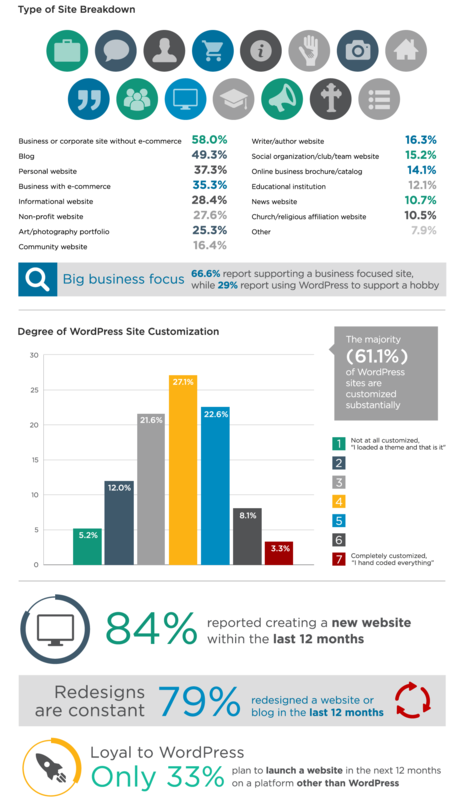 In this section, we take a brief look at how respondents are using and managing their WordPress websites. Plugins are an incredibly important WordPress security subject. They make adding site functionality very easy, but occasionally introduce vulnerabilities. 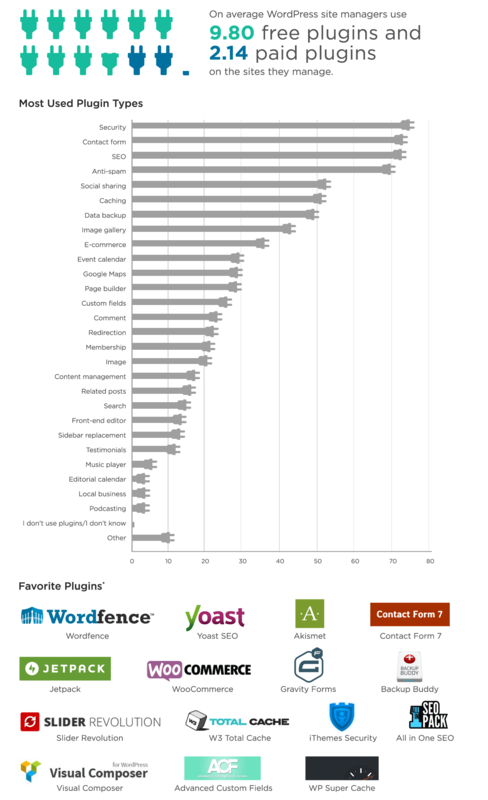 We provide a brief look at the types of plugins respondents are using. In this section we took a look at respondents attitudes toward security and their experiences with recent hacks. Clearly WordPress has evolved beyond its roots as a blogging platform, with the majority of the sites you manage serving a broad array of other purposes. The ease of use of the platform is allowing most of you to manage multiple sites on a part-time basis, with over half of you reporting that you manage 5 or more. While almost none of you make WordPress administration your full-time job, over half of you self-identify as either advanced or expert WordPress users. Despite its obvious ease of use, 61.1% report customizing their sites substantially. As a group you remain very busy updating existing sites and building new ones, with 84% building a new one in the last year and 79% redesigning one. Plugins are an incredibly important asset, with an average of over 10 of them in use on each website. Hacks are all too common, with 38.9% of you reporting a compromise in the last 12 months. As a group, your WordPress security habits are good but not great.We hope you found the survey enlightening. If you find yourself motivated to learn more about what it takes to secure your website after reading it we invite you to check out the rest of our WordPress Security Learning Center. Based on the responses, hacks are happening way too frequently but there are easy steps that can be taken to shore things up.